Generation of ihCD59 knockin mice. (A) Map of the pBT378-CAG-LSL-hCD59 vector for pronuclear injection. (B) General strategies for the generation of ihCD59 mice. The STOP cassette, which prohibits transgene expression, is removed by crossing the inducible transgenic strain to a cell-specific Cre-expressing mouse strain. The consequent expression of the transgene renders the respective tissues sensitive to rapid cell lysis induced by the injection of ILY. 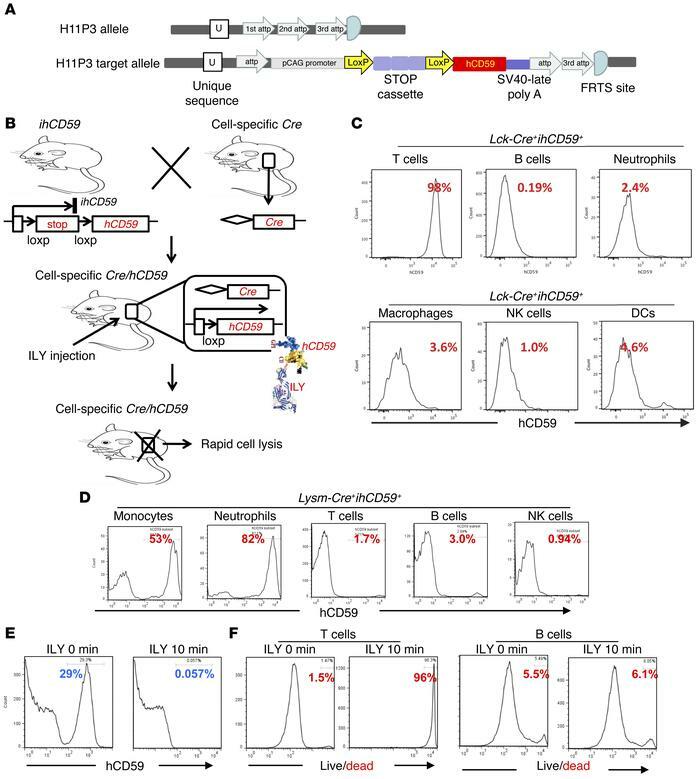 (C and D) Representative FACS analyses of hCD59 expression on T cells in Lck-Cre+ihCD59+ mice (C) and on monocytes/neutrophils in Lysm-Cre+ihCD59+ mice (D). (E and F) Splenocytes that were isolated from Lck-Cre+ihCD59+ mice were incubated with ILY in vitro for 10 minutes. FACS analyses were performed. E shows 29% live hCD59+ spleen cells and 0.057% live hCD59+ spleen cells before and after ILY incubation, respectively. F shows live/dead T and B cells. In C and D, the representative graphs from 5 mice are shown. In E and F, the representative graphs from 4 mice are shown.